Sometimes when I'm writing, everything disappears. I go somewhere, but I don't know where, just not here. In the past, I've described it as a feeling like falling in love. When I'm working on something, really working, I'm not hungry. There's something deep and nervy in my stomach, like butterflies. I don't want to sleep. I don't want to see people. When I'm not putting my characters through the paces, I'm thinking about them, having conversations with them, wondering what they are up to. When I'm creating, the real world, and the real people in it, hold only minimal a draw for me. Yoshihiro Tatsumi describes a similar feeling in his autobiographical work, A Drifting Life. When he is writing something he wants to be writing, it feels something like a runner's high. What is real disappears, and he's right there, right in the story, and that is the place he most wants to be. "There was no freedom in reality," Tatsumi writes of himself in the third person. "The creative act of making something from nothing allowed him to live in an infinitely free world." In one scene, Tatsumi describes working on the classic Japanese comic Black Blizzard, a noir mystery that takes place during a terrible snowstorm. While working on the story, Tatsumi drifted so deeply into the creative world he had created that he found himself shivering at his drawing desk even in the infamous humidity and heat of a Tokyo summer. Reading Tatsumi's story, I feel that creative high by proxy, like a long protracted sigh of relief. This feeling is real, this otherness, this otherly-worldness, this gone somewhere, this imagining: Imagination. It's a place creatives know. It's a place of transcendence, a place we want to bring others through our work. Just knowing that other creators feel it in the same way, makes me not feel alone. I keep a copy of A Drifting Life and a copy of Black Blizzard along with my most cherished books on the highest shelf in my living room, which doubles, triples, quadruples and so forth, as my office, my writing room, sometimes my nap room, my cat's rec room, my dining room, and my creative space. It is the shelf just above my little shrine of happy trinkets - things I've collected in life that have important meaning just to me. On my roughest days as a writer and a creative and on my best, I look up to those books. I feel a kind of being in love with, a creative kinship with Yoshihiro Tatsumi. I don't know if his work is for every reader, but it really is for me. 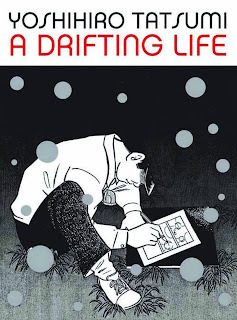 A Drifting Life is as much an incidental history of postwar Japan and an in-depth look at the manga industry during that time as it is an artist's autobiography. It's pace is slow, and it explores the minute details of Tatsumi's career, from his first publications in seventh grade well into his adulthood. It's also about his life as a creator, his desire to rise above commercial success, to innovate and provoke and make something new. For many, it may seem mundane, and it is. That's the life and business of a creative most of the time. It is hard grinding work towards an ever moving goal. Its rewards are those brief moments when it is just you drifting, but not necessarily lost, in the seductive, magical places only you can make and dwell in.